Every once in a while you see an invention that seems a long time coming. The Tacit, a hand-mounted system that pings surroundings and transmits distance information to the user, is one of those. While the reliable white cane and occasional accommodations for the blind and vision impaired ameliorate the difficulty of navigating the world sans sight, technological advances that are both useful and ready for deployment are few and far between. We’ve seen a lot of research into artificial vision systems, and there are often hacked-together projects by people personally concerned with issues like vision or mobility — we’ve seen a Kinect-powered navigation system, the Eyewriter, and Ken Yankelvitz’s paraplegic-accessible controllers. This project is an amazing example of what one guy can do with a soldering iron, some off-the-shelf parts, and an inventive mind. The system uses two ultrasonic sensors that can detect the distance of objects between 2cm and 3m away. Mounted facing off to the right and left, they can be swept across a room and will be able to sense most common obstacles and dangerous objects. 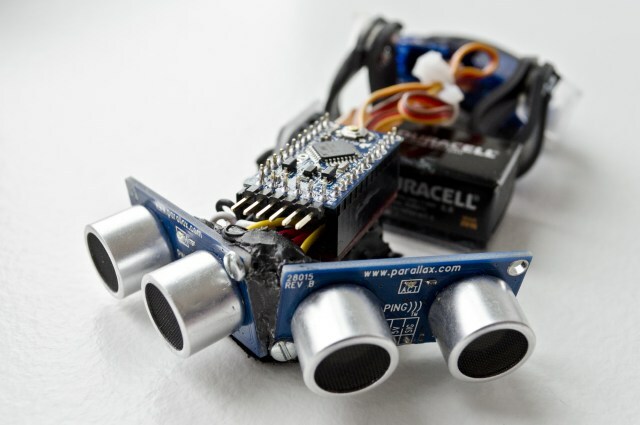 They send their signal through an Arduino Mini controller, which governs a pair of servos. These servos each press a loop of foam down on the wrist: the closer the object, the harder they press. The whole thing is powered by a 9V battery and straps onto either hand. Designs like this are the reason we have a patent system. And while tech companies are filing thousands of patents for trivial UI items and software methods, the inventor, Steve Hoefer, has opted instead to give away his invention for free under a Creative Commons license. As is increasingly common with interesting hacked inventions like this, he has published the parts list, detailed instructions, a circuit diagram, and the source code for the Arduino controller. Hoefer says the system has a learning curve of “seconds,” and I can’t see why that shouldn’t be the case. Nothing is naturally intuitive; everything is learned, even vision and our concepts of space and navigation. Hand-based tactile feedback is something many blind people have grown up with, and the addition of this extra information, while at first foreign, will likely be welcomed as highly beneficial. They have also proven themselves very capable of synthesizing this kind of information into a cohesive mental map — sometimes incredibly so. There are some other haptic vision projects, like the HALO system — but this seems more practical to me. The sweeping of the hand mimics the path of the eye, and unlike a head-mounted system, this one can be used to, say, locate a pen on a table. With such a low cost, it could be easily manufactured and made a common aid item, unlike fascinating but costly and impractical (at the moment) ideas like vision substitution. It’s always heartening to see real inventors inventing real things, and for no other reason than a problem needed solving.